Generally speaking, jellyfish are not very appetising as food. They are composed mostly of water and armed with batteries of nasty stinging cells. Both of those characteristics together they make an unfulfilling and potentially painful meal. Nevertheless, they are fed upon by large pelagic fishes, and there are even some marine animals such as sea turtles that can live on a diet composed entirely of sea jellies. For those lacking the stomach for such squishy and venomous prey, there is still a way for them to obtain nutritional benefits from jellyfishes - and the parasite we are featuring today provides one such pathway. The study we are looking at today focuses on a little parasitic crustacean that belongs to a group known as the Hyperiidea. 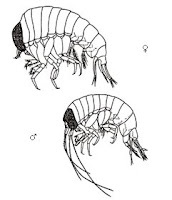 They are amphipods that have evolved to live inside gelatinous animals of the open ocean. In the case of Hyperia curticephala, it dwells within the bell of the medusa Chrysaora plocamia - a rather large jellyfish that can grow up to a metre (a bit over 3 feet) in diameter. Like other hyperiids, individuals of H. curticephala feed on the jellies that they live in. In turn, they can also provide food for those that feed on them. An avid consumer of these little crustaceans is the palm ruff (Seriolella violacea) - a fish that can grow to about 65 cm (about 2 feet) long. The palm ruff is one of a number of fish that are known to be "medusafish" as they are often found in close association with medusa jellyfishes. When scientists examined the stomach contents of small (about 6-10 cm / 2-4 inches long) palm ruffs, they found them to be packed full of H. curticephala and nothing else. As they grew larger, the fish started having a more varied diet, but hyperiids still make up for over 97% of their prey. The amount of H. curticephala in the stomach of palm ruffs reaches a peak in February, just as the parasite also reaches very high abundances in the medusa when some individual C. plocamia can be infected with over a thousand amphipods (which in turn provides a floating banquet for any hungry palm ruff). The abundance of H. curticephala also reaches a high during November, but this was not reflected in the stomach content of the fish - so why is that? The scientists suggested that during this season, most of the medusae available are still quite small and while collectively they might be harbouring a high abundance of H. curticephala, because of their smaller bell size they are inaccessible to the palm ruff (which needs to get in or under the medusa's bell to reach the hyperiids). 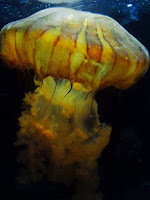 But by February, the medusae have grown to sufficient size that the fish are able to swim inside the jellyfish's bell to peck at the hyperiids. Smaller fish can easily swim inside the jellyfish to feed on the parasites and are often found loitering within the host medusa (which also provides them with protection). Larger juveniles cannot enter the bell and have to settle for pecking off parasites, which happens to be in more accessible positions. In this manner, the palm ruffs act as cleaners for C. plocamia, protecting the jellyfish from the parasitic H. curticephala rather like cleaner wrasses that eat ectoparasites off coral reef fishes. 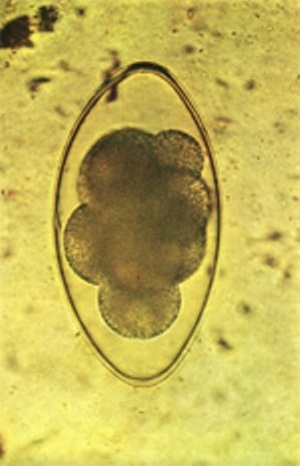 A host can be infected by many different species of parasites (see this post for example). While in some cases, co-infecting parasites can get along just fine, in others, co-infecting parasites end up competing with each other because they both use the same resources from the host. When it comes to such conflict of interest, the stronger competitors can often push other species aside, or even bar their entry altogether. So what can a parasite do in such a situation? Well, it can try and catch their competitors off guard by getting in during the off seasons. During their life-cycle, many parasites go through a free-living stage where they spend some time in the outside environment; either as an egg or a spore, or as a larva that has just hatched or while they are moving from one host to the next. Outside the cozy interior of they host, they can be exposed to some pretty harsh conditions. The parasite we are looking at today is found in the gut of Svalbard Reindeer (Rangifer tarandus platyrhynchus), which live on the Svalbard archipelago in the high arctic. During winter, Svalbard reindeer do not migrate, but instead move around the local area in search of any forage that is still accessible, which is not easy as the ground becomes completely covered by snow during winter. So not exactly the most cozy environment, especially not for the microscopic larval worms which infect these reindeer. There are (non-parasitic) nematodes in Antarctica that can survive extreme cold, but it is not known if the free-living stages of some of their parasitic relatives can do the same. The two most abundant species of nematode worms in Svalbard reindeer are Marshallagia marshalli and Ostertagia gruehneri. For today's post, we will be focusing on a study which looked at the transmission dynamics of M. marshalli. Previous studies suggest that while other worms simply overwinter in the host and only lay eggs during summer, M. marshalli does not care for seasons; it just keeps laying eggs and infecting reindeer all year round, even through winter when their eggs and larvae will be resting on cold, snow-covered grounds. At Spitsbergen, Norway, a group of researchers conducted an experiment to find out if reindeer did indeed pick up any additional worms during winter. To do so, they first fed some reindeer with anti-parasite drugs just before winter to purge them of any worms they already had. The drug wears off after a month, so the deer can start picking up worms again during winter if there are any infectious parasites around. What they found was that in the treated reindeer, after the purge there was no increase in O. gruehneri throughout winter, but the number of adult M. marshalli steadily increased, indicating the reindeer were picking up M. marshalli larvae throughout this period. Marshallagia marshalli is a generalist parasite which also infects a wide range of hoofed animals ranging from sheep in Saudi Arabia, to saiga antelopes in Kazakhstan, to bighorn sheep in Montana, and reindeers in the Arctic - unlike O. gruehneri which is a reindeer specialist. While you'd expect that the reindeer specialist would have evolved such cold-resistant larvae, instead it simply refrains from laying eggs during winter so that transmission only occurs during summer. Because M. marshalli is a parasite of ruminants in dry deserts, their ability to survive such cold conditions might simply come with being able to infect hosts in generally arid and inhospitable environments. The caveat here is that M. marshalli might be a species complex (a group of closely-related lineages which have been classified as a single species due to their similarities), and the species/sub-species that infects Svalbard reindeer might have evolved to withstand the cold as a specialised adaptation for the conditions found in the high arctic. So why has M. marshalli evolved such cold-resistant larvae instead of doing what O. gruehneri does and simply lay their eggs during summer when the larvae will be exposed to more favourable conditions? As mentioned above, Ostertagia gruehneri is a reindeer specialist, so perhaps in order for M. marshalli to have a fighting chance while sharing a host a well-adapted specialist like O. gruehneri, it needs to come in from the cold. 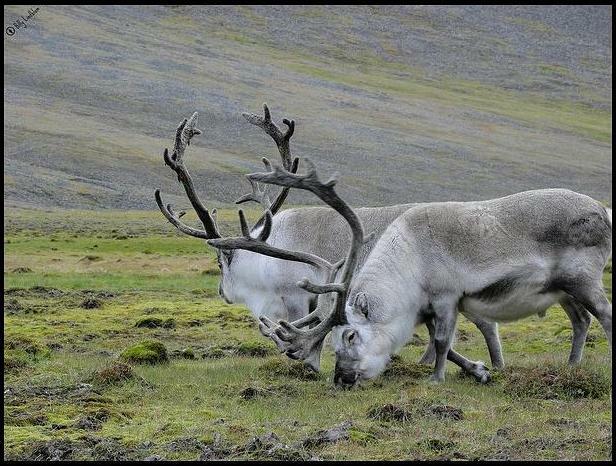 Given how the infection dynamics of these two parasites are so seasonally-dependent, it is unknown how future climate change will affect their respective abundance in their hosts, and what consequences this will have on the reindeer population.